Authorities in San Diego, California are on a manhunt for 32-year old Raymond McLeod who is being sought for questioning in the death of his girlfriend, 30-year old Krystal Mitchell. Krystal was found deceased in her apartment on June 10th and was last seen alive with Raymond. After Krystal died, Raymond left San Diego in a white four-door Infinity or Lexus with Arizona paper plates. He is believed to have fled to Mexico and his car might have been abandoned near the US-Mexico border or in an airport parking lot. 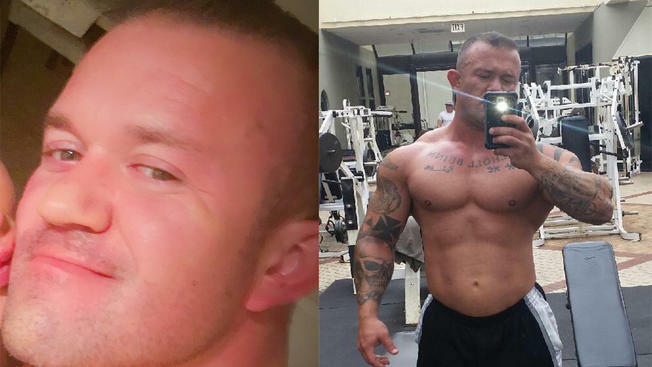 McLeod also goes by the name “RJ” and was described as white, muscular, 5-feet-11 inches tall, weighing 215 pounds and with a birth date of October 3, 1983. Any information regard the whereabouts of Raymond McLeod should contact San Diego Crime Stoppers at (888) 580-8477. Thoughts? Just to mention it again, Raymond has not yet been charged in the death of Krystal Mitchell and is as of now just sought for questioning. Although, travelling to Mexico and not returning after your girlfriend is found dead is pretty suspicious. The cause of Krystal's death has not been fully revealed, only that she suffered chest trauma. I had this in my potential case files but wantd to give it at least a few weeks to see if McLeod got captured first. However nothing wrong with posting it sooner and glad you made less work for me. In any case it should be important to note McLeod is only wanted for questioning at this point. However he obviously should be considered a person of interest given the circumstances. Raymond McLeod was given another profile by Fugitive Watch. Krystal's murder and the search for McLeod was profiled on today's episode of "Crime Watch Daily" so I will move this case to the fugitives on tv section. They mention him initially crossing to the border to Mexico but thanks to investigative work from Krystal's own mother, who used to be a Detective, it was discovered McLeod may have been spotted several times at bars in Belize. Segment(s) isn't on Crime Watch Daily website yet, but I will post them here once they're uploaded. Glad to see that Crime Watch Daily profiled this fugitive case story. If Raymond is in Belize or another Central American nation, then it would be together to find him compared to Mexico. He isn't a national of any of those Latin American countries, so local authorities should be willing to help out and arrest Raymond. If he still has a warrior's build, won't that further stand him out in Latin America combined with his pale complexion? This is probably the reason why he was spotted (if he was spotted) in Belize in the first place. Would make a good case for The Hunt considering their international reach. I'm shocked he still hasn't been located, his appearance makes him look like ur average body builder and I agree the Hunt should profile him, as well as getting federal authorities to help with the manhunt. Just wanted to update that this past April there was a press conference in Phoenix by the victim's mother. No new information from what I can gather from articles this year, most likely he's still in Belize. News report from Belize mentioning that McLeod is still believing to be hiding out in their country and he is still being searched for there. Well kudos to the Belize media for publicizing this manhunt in their country! If only other countries did the same as well. San Diego media out with another story still believing Raymond McLeod to be in Central America. Just wanted to mention in regards to Raymond's profile next week, that In Pursuit should have a good chance of apprehending him in Belize. Reason being is that Lifetime AMW managed to apprehend Larene Austin in the same Central American nation.